Hi folks, I purchased 2 lathe chisels from one of the recommended vendors here and I must say they are very well made. My concern is what to expect that is ‘normal’ with a carbide tool vs. steel. (My old Shopsmith set is not HSS.). I have a square tip and round. I also realize that carbides use ‘scraping’ vs shearing cuts. As I use the square tool to round off the acrylic or acrylester blank, to matter how I try, I hear sounds that sound like chipouts. When I stop the machine I fortunately do not find chipouts, tho’ the surface could be smoother. I have not used it on wood yet. I try to hold the tool at a slight angle and try to move along the length after some of the initial cuts, so I’m actually cutting with the side edge rather than the front. Is this ok? Another concern is turning speed. After watching many pen turning videos, it seems most turners use much faster speeds than I used to use when I was turning wood. Is this because of the acrylic materials? Does increased heat related friction help with cutting the acrylics? Thanks folks. I’m not a rookie turner, but I like to know if I’m making a mistake somewhere. Use the highest speed your lathe has . May well be small chip-outs until the rounded surfaces are 1/4 inch or so . One solution is to grind the corners off on a face wheel with coarse grit . Do you feel chips hitting your face shield ? The bold above is a subject that was discussed here on several occasions several years ago (and probably since then that I have not seen). Bowl turners and even spindle turners do not turn at the same speeds that we normally turn at with pens. The discussions usually started with bowl turners wondering why in the world pen turners turned at high speeds. They were not used to that and in general thought it was excessive, because they were used to much slower speeds. A 12 inch bowl has a circumference of 37.68" or 38" for this purpose. 38" X 700 RPM = 26,600" per minute; 2,217 ft per minute, or 36 miles per hour. That is the speed of the bowl at the outside diameter and at the point the chisel touches it on the edge. A 3/4 (.75) inch pen blank has a circumference of 2.35 inches. 2.35" X 700 RPM = 1,649"inches per minute or 137 feet per minute, or 2.29 MPH, a recipe for a whole bunch of "catches". Speed = smoother cutting - to a point. Some bowl turners who are used to slow speeds and often not convinced early on of the need for higher speeds for pens out of their prior experiences. They are not taking into account the changes in cutting speed at the point of the cut. Notice the higher speeds cut smoother than slower speeds. A car going 10 MPH hits a 2ft pot hole that is 10 to 12 inches deep might need a front end alignment; however hit the same pot hole at 60 mph and the wheel does not fall all the way in and there is a slight bump but no front end alignment problems. While this is not a great example, it is an example that slow cutting can cause catches where faster turning does not. Last edited by leehljp; 03-21-2019 at 10:48 AM. Being Hank did a great job explaining speed I will leave that alone but just will say remember we are turning pens that are small and round spindles. So faster speeds are used for cleaner cuts. The use of carbide tools as scrapers or shear cutting is both fine and will do well. You need to be able to control your tools more-so when shearing because the cutting edge is much smaller and thus will cut cleaner especially end grain. Carbide tools will fall into a tool catagory that does not get discussed much unless you are into bowl making more. That is shear-scrapping. Basically when you raise up a carbide tool from flat on the tool rest and present at an angle that is shearing you are actually combining both worlds and thus the name and yes it is acceptable and I think more recommended. So when you take that round cutter and turn on edge that is what you are doing and it will act much like a skew. To me cuts much better but again you need to understand turning tools and learn to use them properly and hold them properly along with presenting them as well as your body to the piece. Yes agai we are talking small spindles but the principles are the same. There are so many videos on utube and all over the place showing how to use tools properly. I am not going to link them so do a google search and you will find many. Good luck. What you describe here is the method I have long used when roughing a blank down to round. The tool is flat on the rest, but the handle is rotated toward the direction of tool movement. I normally knock off the corners prior to turning so there is less 'rounding' to accomplish and less tendency to split off (wood) or crack off (plastic) a portion of the blank when using the carbide tool. The way I knock off corners is very quick, but potentially dangerous for a low-to-medium experienced person, so will not be described. For turning speed in bowl turning, below is a chart that was sent to me a few years ago and I have since seen it on a few bowl forums. I keep it on the wall behind my lathes. It can be seen that even 3" bowls are recommended to be turned between 2000 and 3000 RPM. A couple of points: My Shopsmith is capable of over 5000 rpms. Seems too fast, but I appreciate opinions. Steve G, I’d like to know more about your corner knock off method. 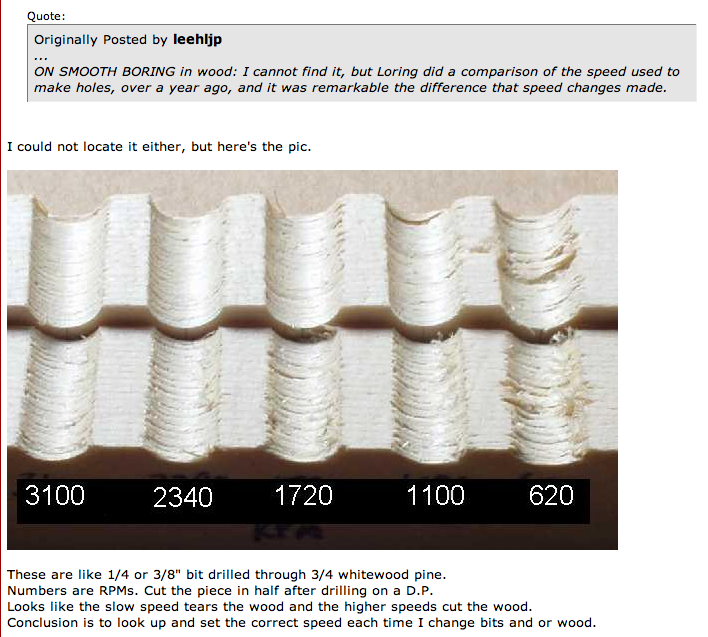 I’m far from low to medium experienced with a lathe. The speed chart as well as the math is VERY interesting and enlightening. Thank you! Charles, You seem to be doing great. You are noticing different sounds and feedback in your turning of acrylic/resin pens as opposed to what you were in Bowl turning. That is somewhat normal with some resins/acrylic. And your way of feeding by cutting with the leading edge is what I do often.